Our M.D. program is designed to ensure that participants graduate with a common foundation of knowledge, skills, values, and attitudes. This general professional education prepares graduates for subsequent education in primary or specialty care areas. 4 year degree. This does not include the 4 year baccalaureate degree required prior to admission to the program. The undergraduate medical education program in the College of Medicine is a four-year program leading to the Medical Doctor (M.D.) degree. Upon earning the M.D. degree, students are then eligible to apply for postgraduate training in the discipline of their choice. The first two years of medical education are called pre-clerkship. Students learn basic sciences and how to apply that learning in clinical conditions. They learn how to take medical histories and perform physical exams, first on standardized patients and then on real patients. At the same time, they are introduced to the factors that can affect both people’s health and how they function in society. 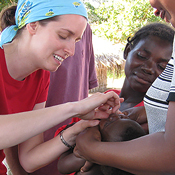 Students have the opportunity to participate in research and earn Global Health Certification. After pre-clerkship comes clerkship. During year three, which is the first year of clerkship, students put into practice what they have already learned. They participate in clinical rotations and provide patient care both in hospital and in outpatient clinics. 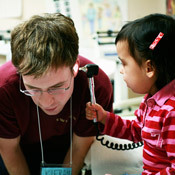 Clinical experiences occur not only in Saskatoon, Regina and Prince Albert, but also in rural and remote communities throughout Saskatchewan. In year four, students have further opportunities to experience different fields of medicine by participating in electives in Saskatchewan and at other medical schools throughout Canada. This prepares them for choosing a residency program at the end of year four. The state of the-art, integrated facility supports and enables collaboration among students, faculty and researchers in all health science disciplines and helps to educate health professionals using a team-centred approach. We have introduced leading teaching concepts, conducted broad research investigations that advance our understanding of health issues and continue to explore how to best provide clinical services that respond to the needs of today’s patients. The College of Medicine is committed to incorporating social accountability to direct its clinical activity, advocacy, research and education (CARE) and training activities towards the priority health concerns of local, regional, national and international communities. The college supports a number of programs and initiatives that address community health needs, including Aboriginal health, primary health care, urban and rural underserved areas, gender and equity, eco-health, immigrant and refugee health and global health. Electives in Aboriginal Health that blend Western and Indigenous knowledge are available in year four. These electives give you the opportunity to work with Elders, Healers or Aboriginal communities. You may also go off-site to assist in clinical care in surrounding First Nations communities. We offer this accredited program for first-year MD students that focuses on preparation for work with marginalized under-served communities locally and globally. Rich in interactive, experiential, and didactic learning opportunities, this is currently the only undergraduate certificate in Global Health in Canada. Our college has an exceptionally active student body with leadership from the Student Medical Society of Saskatchewan (SMSS). Some examples of other diverse student groups include: Aboriginal Rural and Remote Health Group Living Well: Physician Wellness Initiative Equity, Diversity and Gender Group. In addition, our Pre-Med Club helps students prepare for all aspects of medical school applications. The College of Medicine is committed to increasing the number of Aboriginal physicians in Canada and has developed programs and initiatives to encourage and support Aboriginal students, including a mentorship program and Pre-Medicine Awards for Aboriginal Students. After medical school, graduates enter into a residency program. 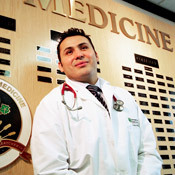 The College of Medicine offers residency programs in primary or specialty care areas. Residency training varies from two years for certification by the College of Family Physicians of Canada to four to six years for certification by the Royal College of Physicians and Surgeons of Canada. Tuition estimates reflect a typical amount you could expect to pay per year (2018-2019 rates). Read through the Admission information below to see what is needed to be considered for admission. While prerequisite courses are not mandatory, applicants are strongly encouraged to complete equivalent/similar courses (introductory level Biochemistry, Chemistry, Biology, Physics, Statistics, Sociology and Psychology) to ensure readiness for the basic sciences covered in the first two years of the undergraduate medical curriculum and to prepare for the MCAT as well. 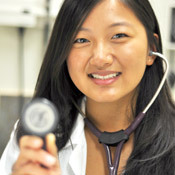 The Pre-Med Club helps students prepare for all aspects of medical school applications. They offer a range of preparatory and informative sessions such as mock MCATs, MCAT info sessions, multiple mini interview (MMI) prep groups, a mock MMI, a medical school applications crash course, a volunteer opportunities info session and much more. Saskatoon: Join the Pre-Med Club by email or via Facebook, U of S Pre Med Club. Regina: Contact them by email or via Facebook, University of Regina Pre-Medicine Club. The admission information below provides a cursory review. Please ensure you've read the entire Applicant Information guide prior to applying for admission to the program. The guide contains the official admission policies. You must have lived in Canada for at least three years prior to August 1 of the year in which admission is being sought and you must be a Canadian citizen or have Permanent Resident status by the application deadline of October 1. If you are a Permanent Resident and your Permanent Resident card expires between the application deadline and September 1 of the year of admission, if you were to receive an offer of admission, it would be conditional upon receipt of an updated valid card prior to the starting of your medical training. 95% of first year positions are reserved for Saskatchewan residents. You must have physically resided in Saskatchewan for three years immediately preceding the year you are seeking admission. Exceptions are made for long time residents, and members or family members of the Armed Forces of Canada or RCMP. Using the same criteria above, residents of the territories can apply as Saskatchewan residents. Ten first year spaces are reserved for qualified, self-identified First Nations, Métis, and Inuit students through our Aboriginal Admissions Program (these seats are included within the 95% allocated Saskatchewan positions). The DSAAP will involve 6 seats. A maximum of 5 seats are reserved for Out-of-Province residents. MCAT: you will need to complete the Medical College Admission Test (MCAT) before the application deadline and arrange to have all of your scores released to our office during the specified time. See below for more details. Four year Baccalaureate Degree Completed by April 30 and Awarded Prior to Entry into Medicine: to apply you need to have completed, or be in your last year, of a four year degree program. Admission average: the minimum admission average will change depending on your residency status. Personal qualities are assessed primarily by a multiple mini-interview (MMI) held during one weekend in March. Not all candidates will be invited to the interview phase. Applicants whose primary language is not English may be required to present proof of proficiency in English. The M.D. program tuition is $17,474 for the 2018-2019 academic year. Applicants who are offered admission must pay a non-refundable deposit of 10% ($1,747) of the tuition by the deadline date of the acceptance of the offer. That is, candidates who withdraw their admission acceptance after paying the fee will forfeit the 10% deposit. For full details on the Immunization Requirements please view our policy. NOTE: The MCAT must have been written prior to the application deadline of October 1, 2018. You must request that all of your MCAT results be released electronically specifically to the University of Saskatchewan, College of Medicine, via the Association of American Medical Colleges (AAMC) MCAT Test Site and specifically between October 23, 2018 and October 31, 2018. Even if you have released your scores to the University of Saskatchewan, College of Medicine prior to October 23, 2018, you must re-release them during the above stated time period. Only scores released during the above stated time period will be considered. For application fall of 2018 for entry fall of 2019, no minimum MCAT section or total score percentile will be required (however, see the next paragraph). MCAT scores must be obtained in one sitting prior to the application deadline. The earliest accepted scores for application 2018 for entry fall of 2019 are from April 2015. Only the most recent MCAT will be considered. Confidence bands are not considered and any further AAMC adjustments to percentile scores after our MCAT score release deadline of October 31, 2018, will not be considered. We will not confirm receipt of MCAT scores. The Admissions Committee will review the MCAT scores received and set the minimum MCAT score for the current application cycle. In the last admissions cycle for entrance in 2018, the Committee removed applicants from further consideration if their total MCAT score was < the 26th percentile in their most recent MCAT written April 2015 onwards (the required total MCAT score for application to enter in 2019 likely will be similar to last year or slightly higher). The Admissions Committee, in assessing an individual’s application, will review the MCAT section scores for consistency and for concordance of the MCAT total score percentile with the individual’s university academic average (UAA). Inconsistency within the MCAT section results, or discordance between the MCAT total score percentile and the UAA (e.g., MCAT result unexpectedly low based on the UAA), can serve as grounds for the Admissions Committee to remove an individual’s application from further consideration. While prerequisite courses are not mandatory, applicants are strongly encouraged to complete equivalent/similar courses (introductory level Biochemistry, Chemistry, Biology, Physics, Statistics, Sociology and Psychology) to ensure readiness for the basic sciences covered in the first two years of the undergraduate medical curriculum and to prepare for the MCAT as well. Registration for the MCAT is online at www.aamc.org/mcat. NOTE: The MCAT must have been written prior to the application deadline of October 1, 2018. You must request that all of your MCAT results be released electronically specifically to the University of Saskatchewan, College of Medicine, via the AAMC MCAT Test Site and specifically between October 23, 2018 and October 31, 2018. Even if you have released your scores to the University of Saskatchewan, College of Medicine prior to October 23, 2018, you must re-release them during the above stated time period. Only scores released during the above stated time period will be considered. For application fall of 2018 for entry fall of 2019, MCAT scores must be obtained in one sitting prior to the application deadline. The earliest accepted scores for application 2018 for entry fall of 2019 are from April 2015. Only the most recent MCAT will be considered. Confidence band scores are not considered and any further adjustments to percentile scores by the AAMC after our MCAT score release deadline of October 31, 2018, will not be considered. We will not be confirming receipt of MCAT scores. A minimum of the 80th percentile for the test sum score and for each of the four section scores is required. Only the most recent test will be considered. As we have limited interview spaces, for entrance in 2018, the Out-of-Province resident minimum MCAT cutoff for an interview invitation was at the 99th percentile with a minimum CARS score of the 90th percentile. Deadlines: Applications open in early August 2018, and the deadline to apply is October 1, 2018 at 4:00 p.m. Saskatoon time for entry in August 2019. Please ensure you've read the entire Applicant Information guide prior to applying for admission to the program. A non-refundable application fee of $125 CDN is required before your application will be processed. The four year Doctor of Medicine (M.D.) 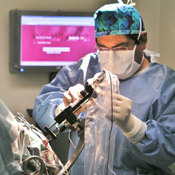 is offered by the University of Saskatchewan's College of Medicine. 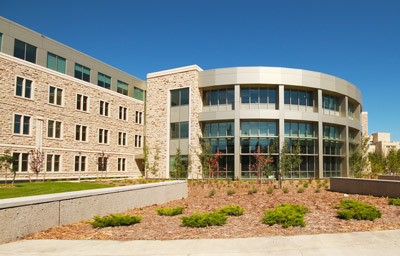 Established first as the School of Medical Sciences in 1926 and later as the College of Medicine in 1953, the College has a full range of academic programming, including the School of Physical Therapy and the Division of Biomedical Sciences. 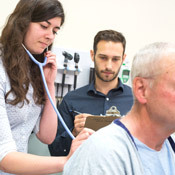 The College of Medicine serves the people of Saskatchewan by producing outstanding clinical practitioners, generating new knowledge and facilitating improved patient outcomes.